Due to the particular sensitivity of commercial districts that run through residential neighborhoods, the zoning code specifies that development projects within established NPC corridors are subject to a heightened level of review to ensure compatibility with the character of the district. This doesn't necessarily prevent incompatible development projects. Indeed, developers are often able to push incompatible projects through the political process despite the intent of the zoning ordinance to promote consistency. Some of the key elements of the NPC are highlighted below. Buildings should frame the street and maintain a minimal setback from the street. This establishes the fundamental character of the district as a pedestrian-oriented area. 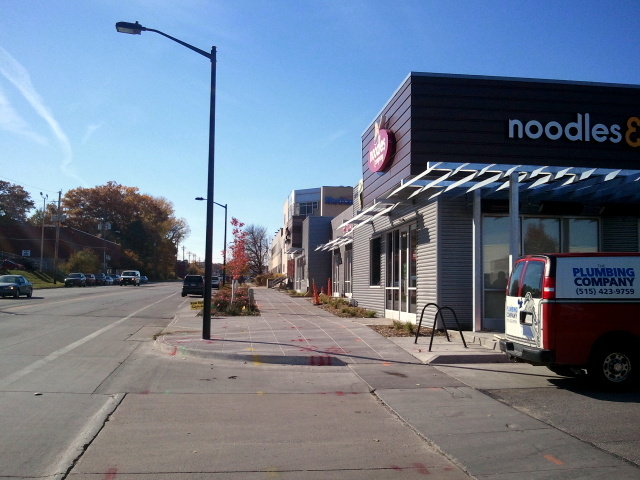 The idea behind this requirement is to encourage a walkable, urban feel instead of a suburban strip mall feel. Pedestrians are typically safer and more comfortable walking parallel to the street, separated by a zone of parking/planting. Retail and restaurants built right up to the sidewalk allow for a feeling of enclosure in addition to creating a good relationship between the pedestrian and the business. The front facade of the first floor of the building on the primary commercial street should have a ratio of at least 40 percent window and window display area to total street facade. The more windows, the better the relationship between the pedestrian and the business. Windows into the district businesses add interest and create a feeling of uniqueness. The front entrance should be oriented to the street. On a corner lot, the building should have a well-defined entrance on the primary commercial street. Clearly, businesses in a pedestrian-oriented district should have an entrance from the main street/front sidewalk. If there is parking in back, it is important to make the path from the parking to the street a comfortable and easy one. The underlying idea behind Neighborhood Pedestrian Commercial districts is to encourage people to park, leave their cars, and walk from store to store on the main sidewalk. Materials should be brick, stone, tile, stucco, or horizontal wood clapboard with a maximum width of six inches. Two-story buildings are encouraged. I don't agree with a defined material palette in the code. The guideline should be performance-based, not prescriptive. Commercial buildings with over 50 feet of building frontage should have the appearance of being broken into separate bays of between 20 to 35 lineal feet using structural elements, fenestration patterns, protruding or recessed bays, or architectural details. This is about making sure that the development is scaled appropriately to the pedestrian rather than being overwhelming. Building frontage should occupy at least 50 percent of the primary street frontage. Consistence and density of use is key to a successful pedestrian district. The minimum number of off-street parking spaces is 60 percent of the number of spaces otherwise required. Prescriptive parking requirements are an interesting problem. Often, the amount of parking required by zoning codes is more than actually required on all but a few days each year. This leads to an abundance of empty spaces that cost a lot of money to build and maintain. Parking should not use the front yard but should be concentrated along the side and in back of the building in the predominant pattern of character defining buildings. Shared parking among businesses or between business and residential projects will be allowed. This provision recognizes that in a walkable business district, it is not necessary to have enough parking for each business to be fully occupied at the same time. Retail will tend to be busier during the day, and restaurants will tend to be busier in the evenings. Some businesses will have more customers on the weekends and other will have more customers on week days. Shared parking allows for resources to me more efficiently allocated. The landscape plan should generally enhance the visual appearance of the building, parking area and any pedestrian areas. Plantings are an important component to the appearance and functionality of the district. The use and design guidelines work together to create a framework for guided development. The vision has been defined by the community through the Ingersoll Master Plan (download PDF 900k) released in 2012. NPC zoning supports that plan. But it only works when the district is cohesive and consistent. This development at the corner of Ingersoll and MLK holds the street face, though at this particular location, it would have been nice to see a multi-story building. Gaps like the Dahl's suburban-style store work against the underlying concept of pedestrian commercial and are contrary to the established plan. If took many gaps are allowed, the Ingersoll district will not be successful. Hurd Real Estate's assembly of a large parcel of land for redevelopment at the corner of 31st and Ingersoll presents both potential problems and grand opportunities. If a suburban style building - such as a CVS or anything with a drive-thru - is built, the work of the master plan will be destroyed. Planning staff, Zoning Board of Adjustment, and our elected officials must do a better job of enforcing the intent of the plan then they have.